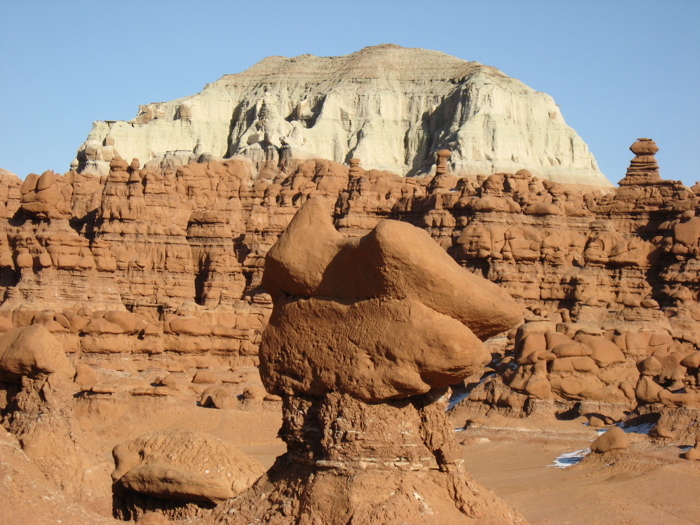 In northeastern New Mexico stands a cinder cone volcano that erupted sometime between 56,000 and 62,000 years ago. Lava flows spilled forth over almost 16 square miles. 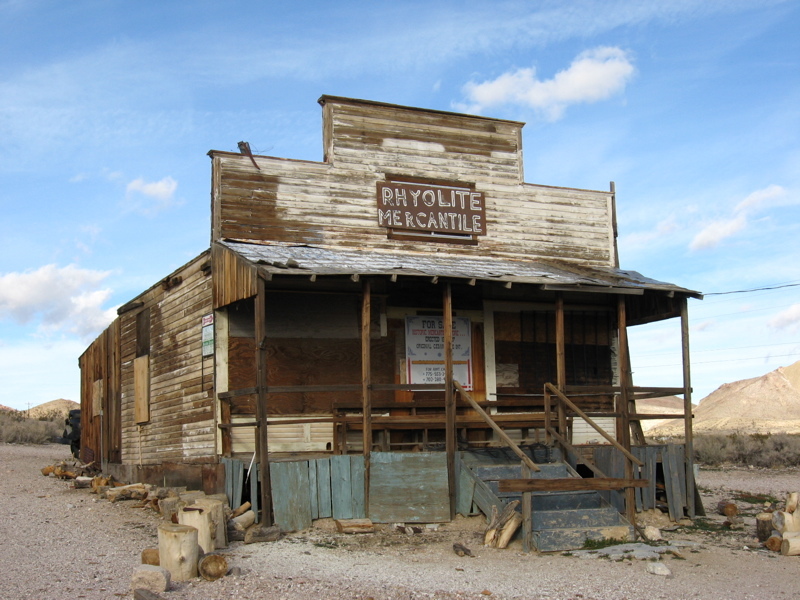 Now the plants and animals have returned to this once steaming and explosive place. 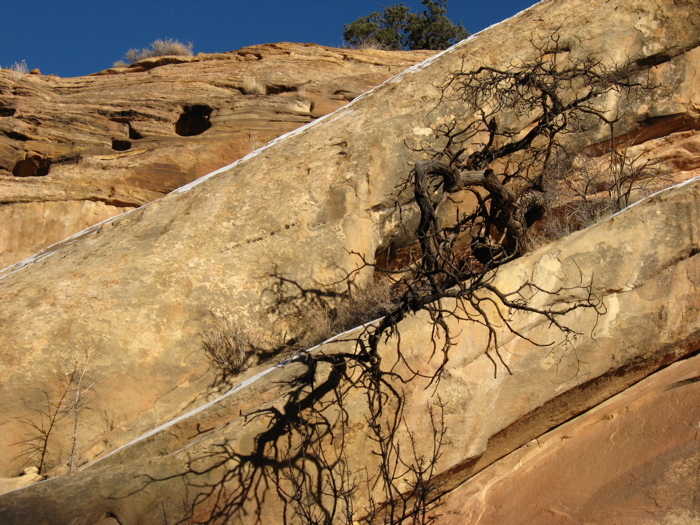 Juniper and pinyon pine trees cover the sides of the volcano, roots growing down into cracks between the cinders. 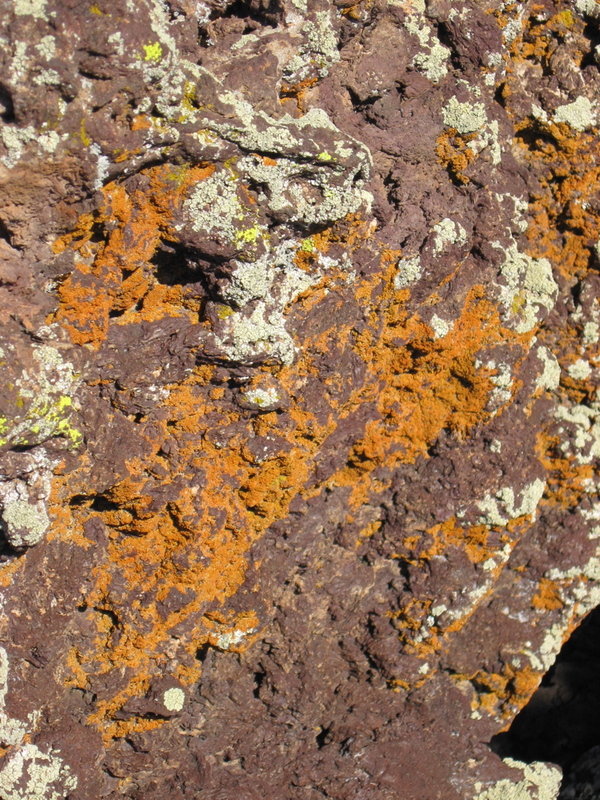 Lichen colonies, some as old as 20,000 years, grow in colorful batches on the side of volcanic boulders. 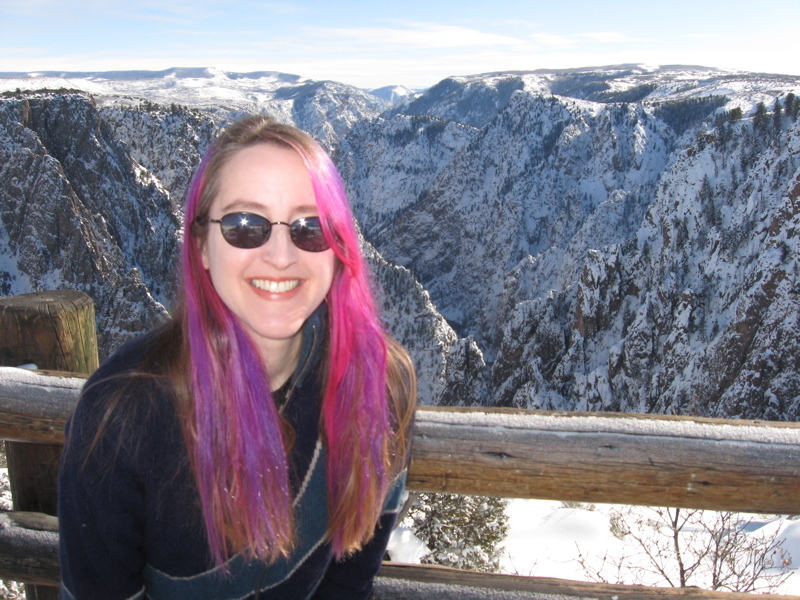 We first hiked down into the crater, gazing up the steep sides to the blue sky above. 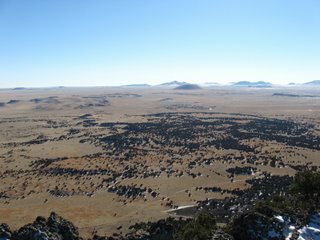 Then we summited the volcano, climbing to more than 8000 feet, and looked out over an amazing vista. Other cinder cones and the tremendous shield volcano, Sierra Grande, loomed over the scenery, all part of the massive 8000-square-mile Raton-Clayton volcanic field. In the distance we could see the snowy range of the Sangre de Cristo mountains, the same mountains we'd seen up close at the Great Sand Dunes in Colorado. 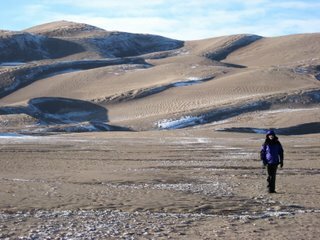 After a chilling, snowy and awesome stay in Gunnison, CO, we've now headed southeast to the Great Sand Dunes National Park. It got down to -40 degrees! Huge dunes rise on the horizon, some as tall as 750 feet. 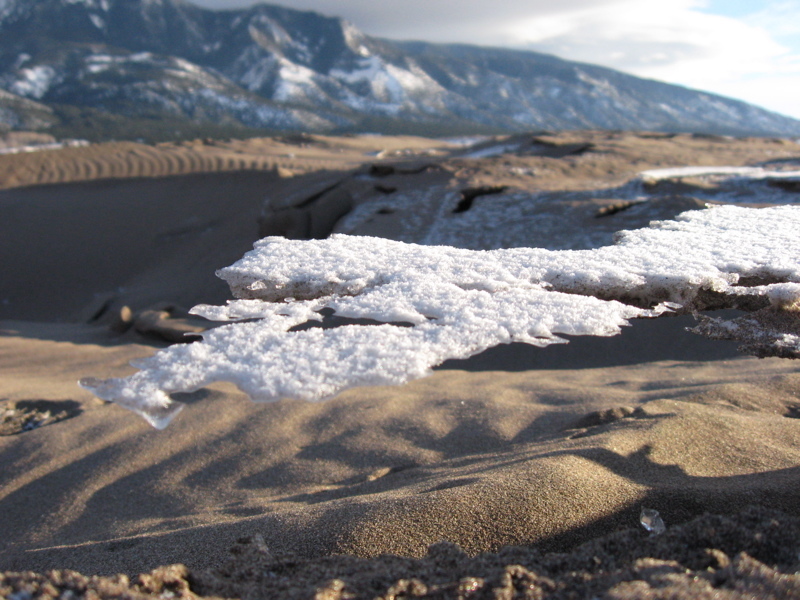 Frozen right now, they've taken on strange shapes, carved by the wind, snow and ice. 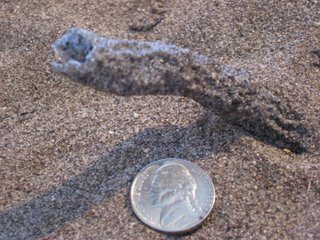 When lightning storms build up in this area, forks of lightning strike the sand, creating tubes of fused sand called "fulgurites." 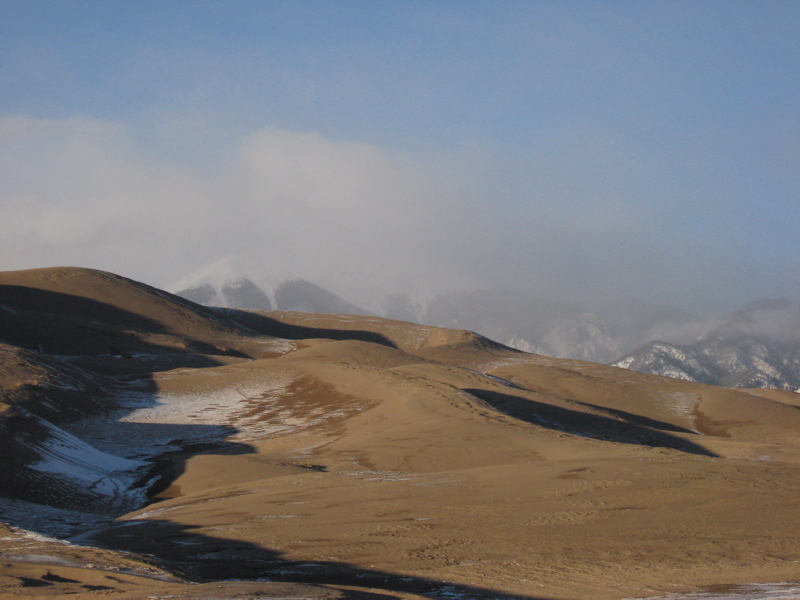 Above the dunes looms the snowy range of the Sangre de Cristo Mountains, which house lush alpine meadows and forests. 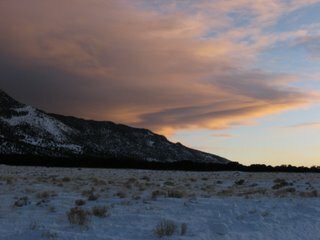 A storm rolled in as we left, the clouds lit up by the setting sun. Freezing...wonderfully freezing. 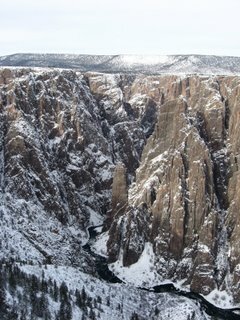 At the Black Canyon of the Gunnison, near vertical canyon walls plunge 2000 feet to the roaring white water of the Gunnison River. 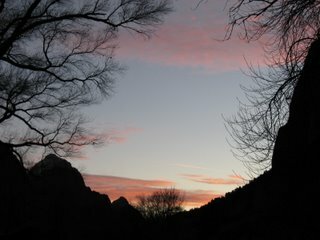 About 4 degrees, the air was crisp and so cold icicles formed on my eyelashes. We hiked to the South Rim of the canyon, peering down into its depths, the roar of the water echoing up the walls. 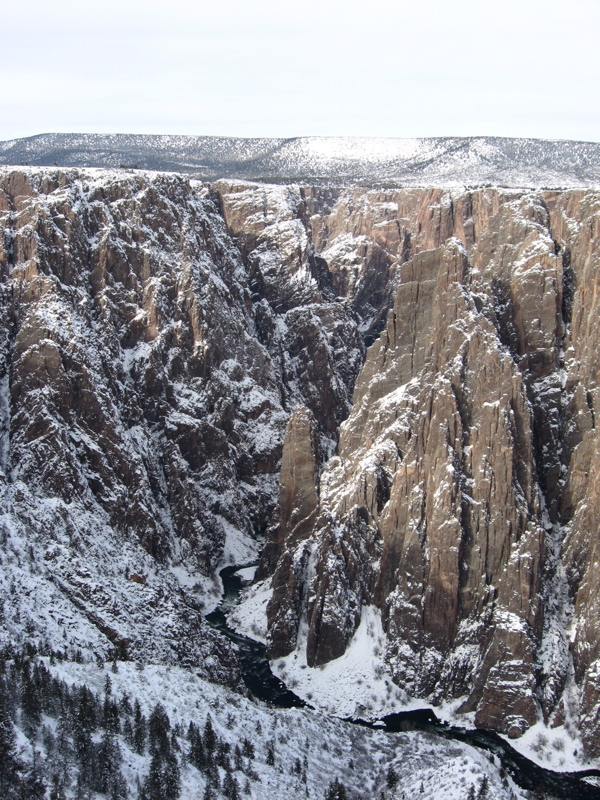 The canyon almost seems to come out of nowhere -- from gently sloping foothills suddenly appears this phenomenally steep canyon of ancient rock, dating back nearly two billion years. A vividly blue scrub jay hopped about in the chilling air, pulling frozen tidbits out of snow banks and gulping them down hungrily. It flew up to a treetop, puffing up its feathers against the cold. 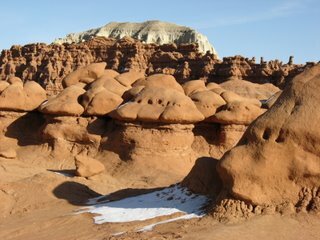 Goblin State Park is so eerily wondrous that it's like being on another planet. 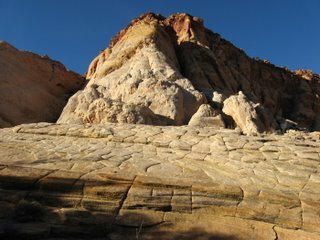 Alternating layers of sandstone and siltstone make the rocks here weather into incredible shapes. 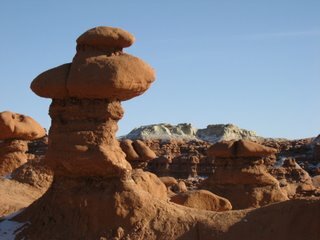 We hiked around Goblin Valley, taking in the strange formations. 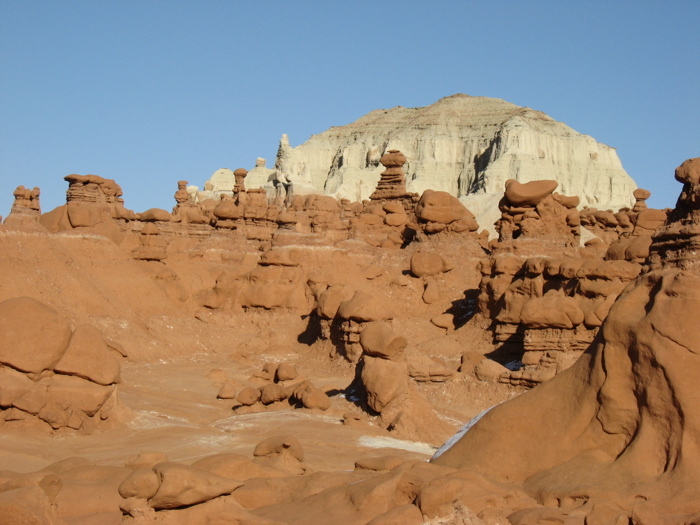 In the distance towered mountains topped in sea green rock formations. Snow dusted the many whimsical and fantastical shapes, white against the vibrant red of the goblins. 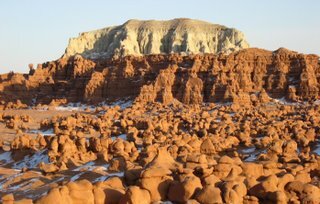 With little to no vegetation in sight, and surrounded by these fanciful shapes, it truly does feel like an alien world. 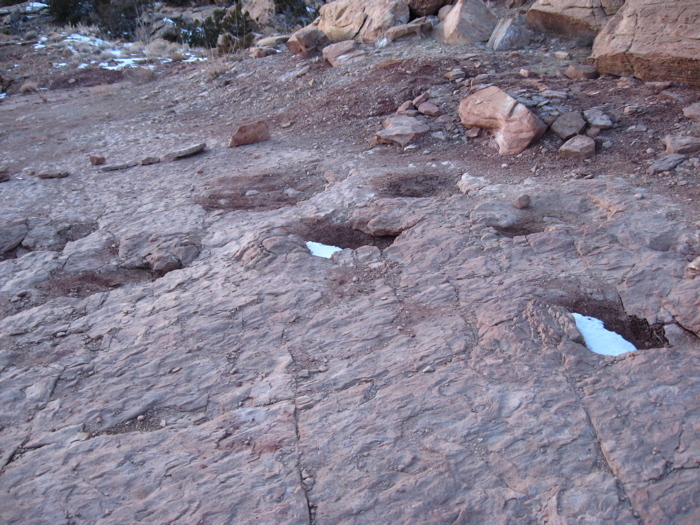 Outside Moab, Utah, lie some of the coolest, most defined dinosaur tracks I've seen. 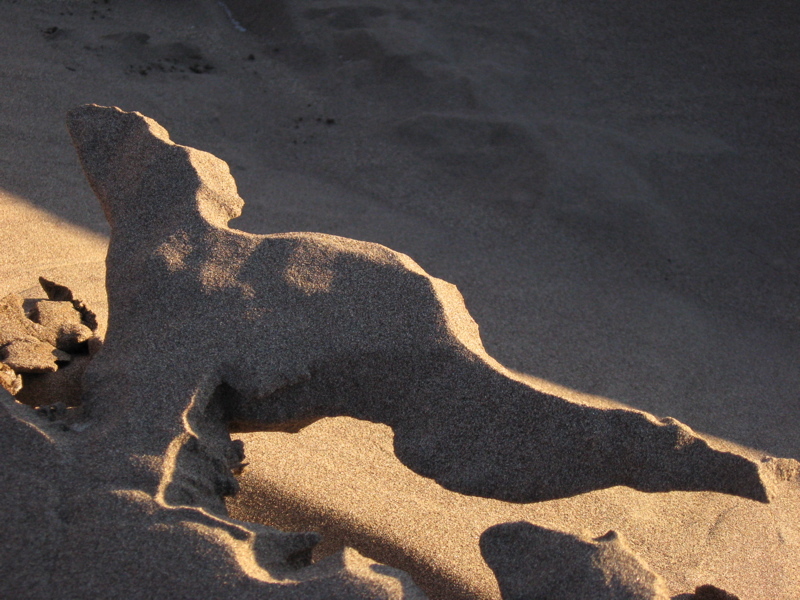 A tremendous lumbering sauropod, probably a camasaurus, walked along a drying streambed. 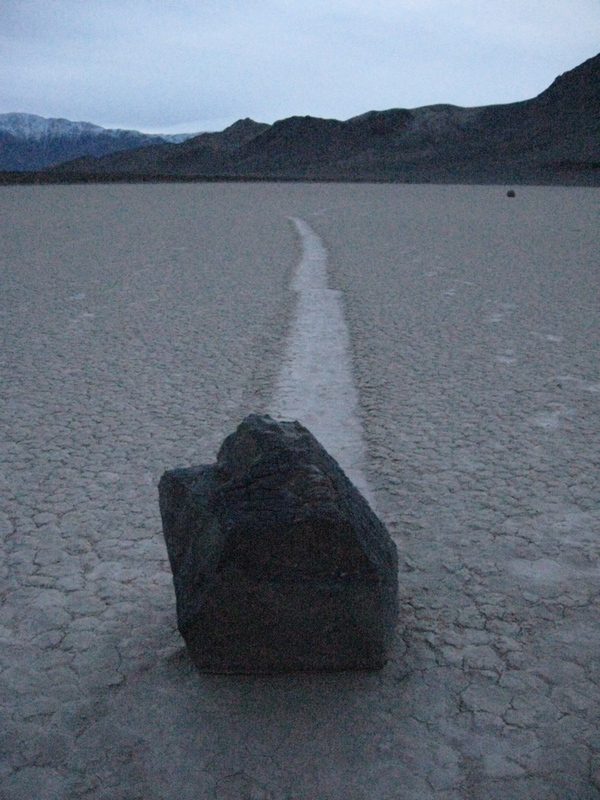 It turned to the right, one of the few tracks in the world showing such a change in direction. Around the same time, an allosaur ran across the streambed, its individual footprints so far apart in its impressive gait that I really got the intense sensation of how huge these creatures really were. 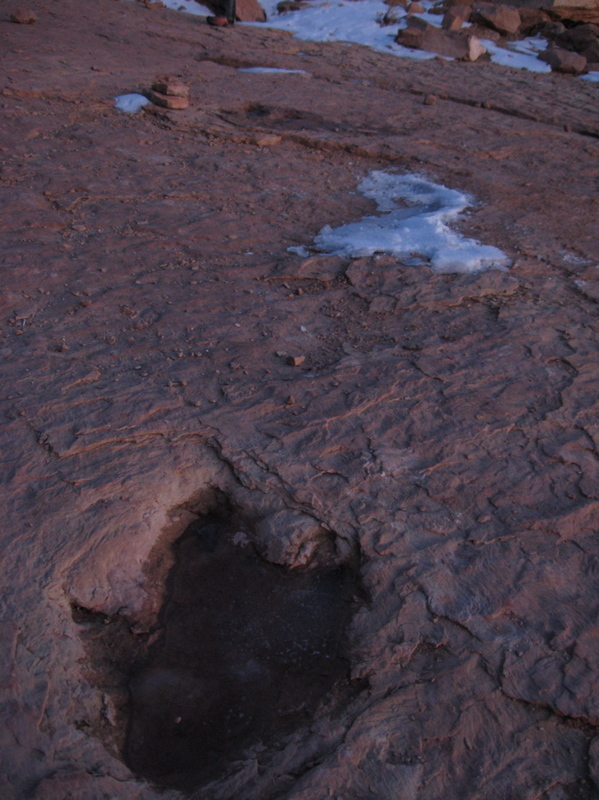 Other smaller theropods, perhaps carnosaurs as well, had run in the same tracks as the sauropod. 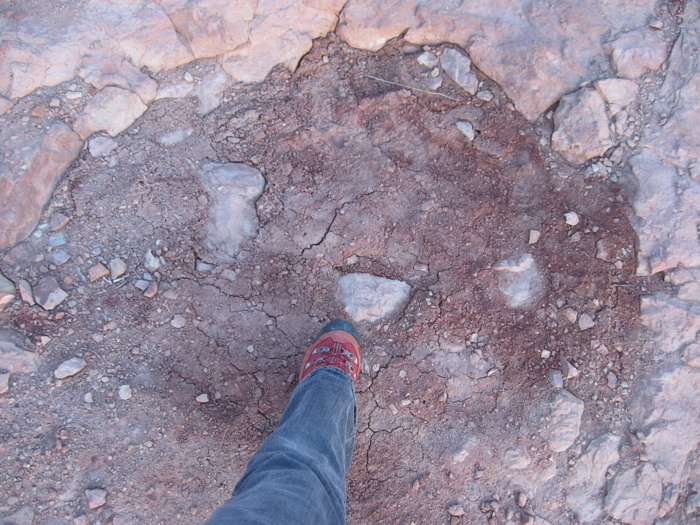 Their three toed footprints left deep impressions in the once muddy soil. 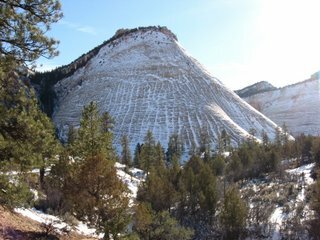 As I stood next to the allosaur prints, I imagined this magical place millions of years before. I imagined what that allosaur must have seen, must have smelled, as it raced along a landscape untouched by human design. Arches National Park was the coldest I've ever experienced it. An icy blanket of snow lay over the dramatic red sandstone arches and unique formations. 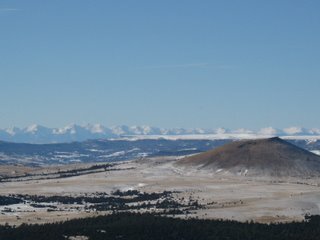 In the distance, the La Sal Mountains glistened with fresh snow. 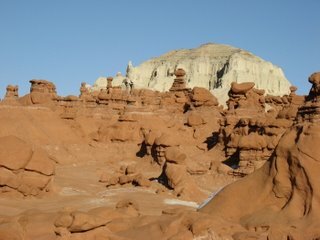 We hiked first to the Delicate Arch viewpoint. 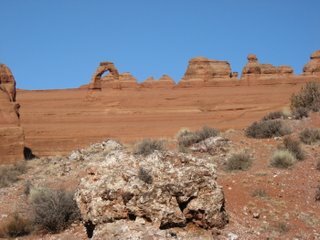 Out on the slickrock, the wind whipped around us, numbing our faces. 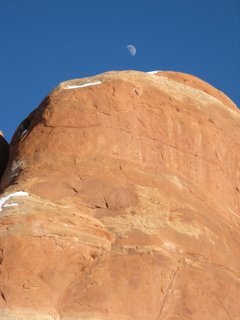 A gorgeous half moon had risen above this desert landscape, silver in the blue sky. 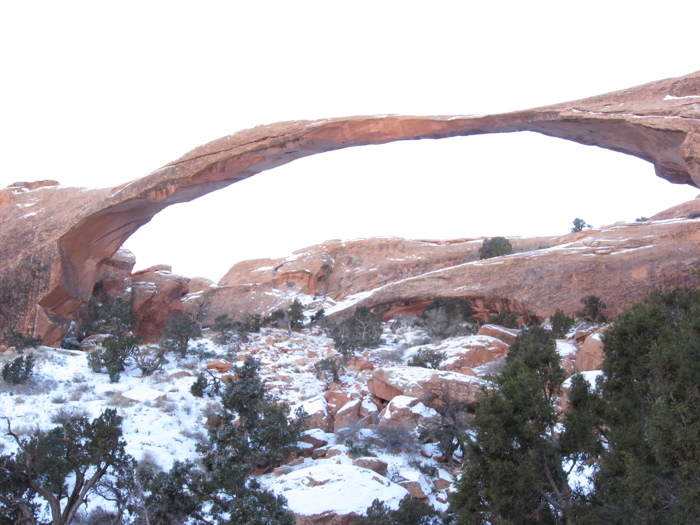 We hiked then to Landscape Arch. 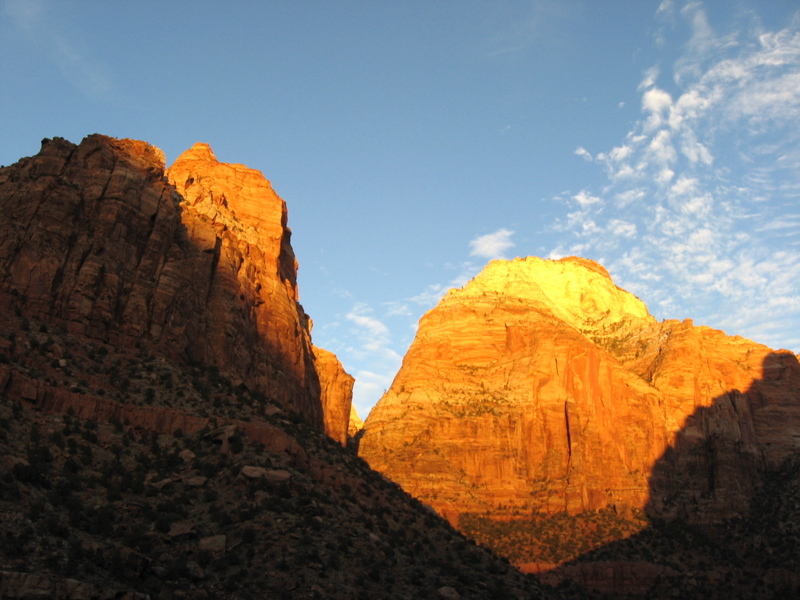 Landscape spans more than 300 feet, and is as thin as six feet in one place. 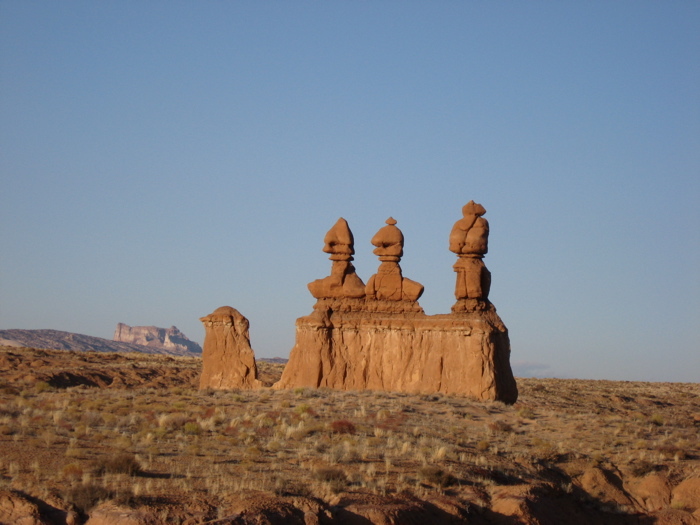 A dramatic, sweeping formation, it instills awe in the quiet, desert scene. 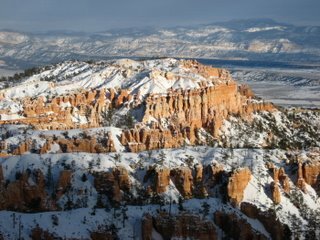 At 8000 feet, Bryce is even snowier than Capitol Reef National Park. The town of prairie dogs we saw last summer are now hibernating, buried under a blanket of snow. 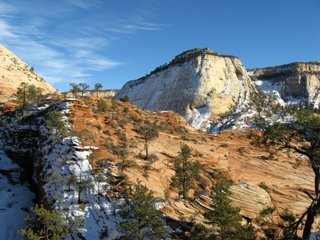 We walked to Sunset Point, where a gust with a subzero windchill blew out of the Ampitheatre area, freezing us instantly. 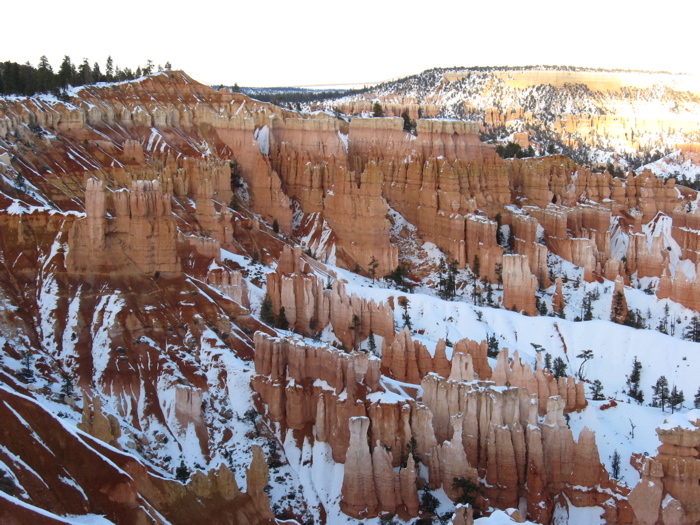 The strange and wondrous hoodoos of Bryce Canyon stretched out before us, with redrock mesas in the distance. The hoodoos are created when layers of different rock types weather at different rates, leaving behind columns. More resistant rock weathers slower, leaving a capstone on top of more fragile rock. 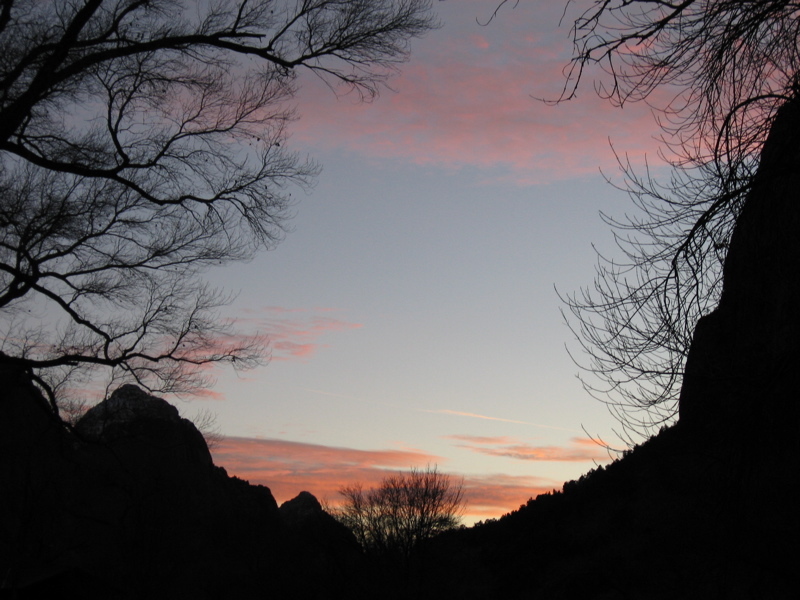 We watched the sun set, and the long light of pink alpenglow settled over the tall spires of rocks around us. 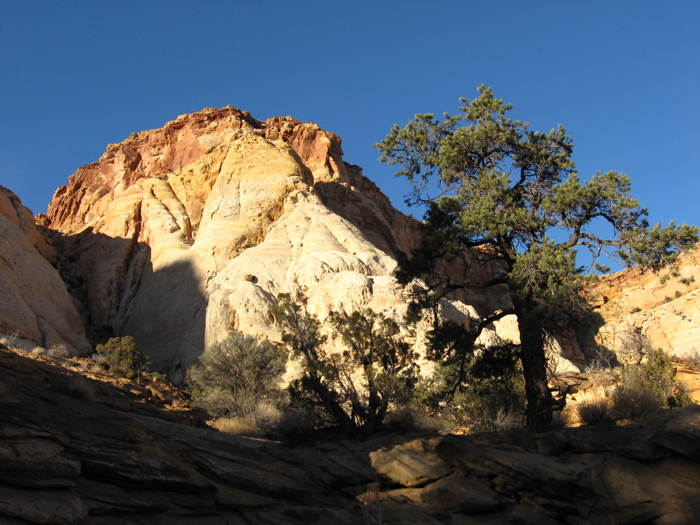 On the east side of Capitol Reef stands Navajo Dome. 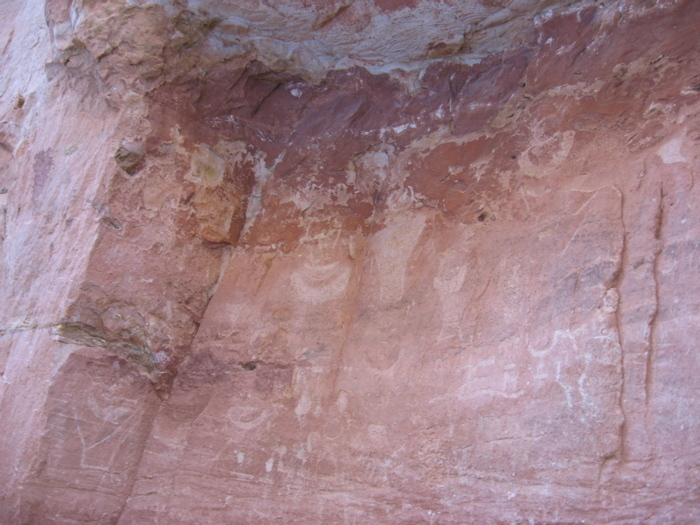 This kind of feature abounds in the park and is what earned the park its name. Early visitors thought the domes looked like capitol buildings. 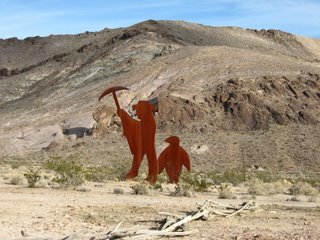 Many of the first navigators, who crossed this terrain looking for routes for pioneers, hailed from maritime backgrounds. When they found unnavigable land, they often dubbed it a "reef," much as a barrier reef is impassable by ship. Six hundred to a thousand years before frontiersman came through this area, it was inhabited by the Fremonts. 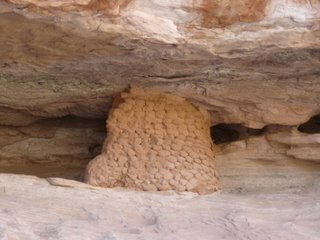 We visited an ancient granary constructed by them, which was cemented together with mud. Stone doors covered the entrance, which were then cemented with mud, as well. This kept out rodents. The park is beautiful today beneath the blue sky, ice thick along the banks of the Fremont River as it meanders through the park. Capitol Reef is stunning and snowy, many colors of sandstone beneath a deep blue desert sky. We hiked deep into Capitol Gorge, where steep canyon walls rose high on both sides. A thousand years ago, ancient artists pecked petroglyphs into the canyon wall here. 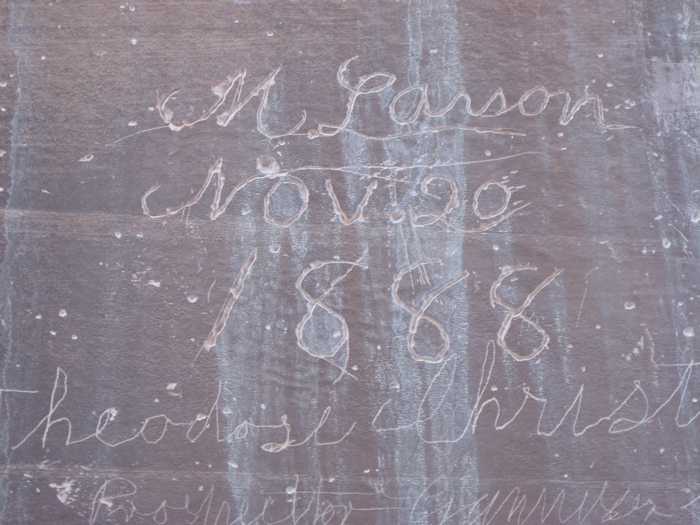 Eight hundred years later, pioneers followed in their wake, carving their names and dates into the desert varnish of the sandstone. 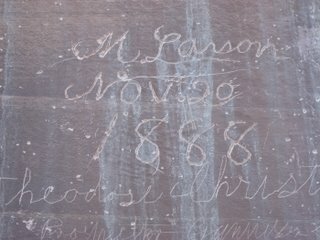 Dozens of signatures, ranging from the 1870s to the 1920s, cover a section of wall called the Pioneer Register. Farther into the gorge lie the Water Tanks, deep holes in the rock that hold water all year long, even during the summer. Today they were frozen solid, though desert bighorn tracks still led down to their edges. 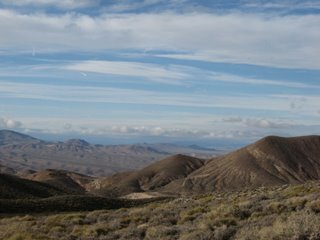 This entire area was once covered in a lava flow. 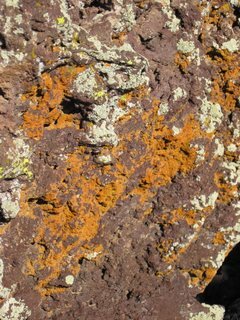 It added volcanic elements to the already wonderfully strange rocks decorating the mountainside. 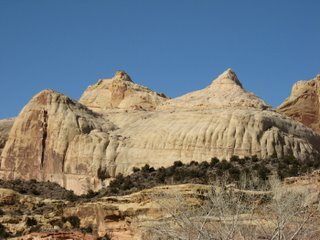 Capitol Reef is a beautiful place this time of year, the white of snow against the towering spires and cliffs of sandstone. 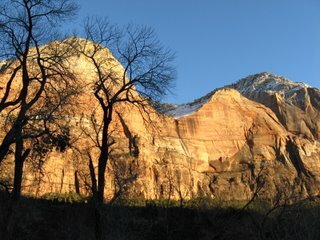 We hiked through a slot canyon on the east side of Zion National Park. 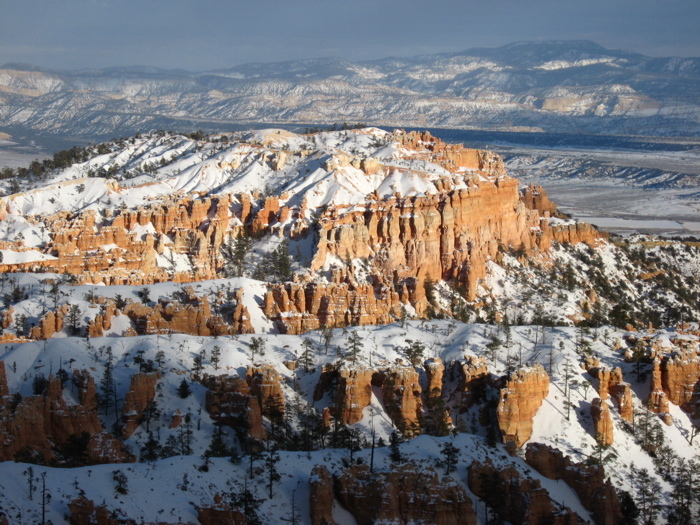 Snow covered Checkboard Mesa. 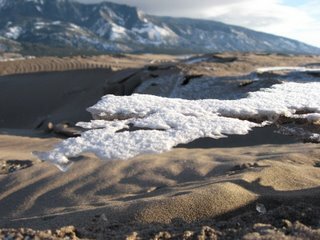 Most of the small springs, seeps and creeks were entirely iced over. 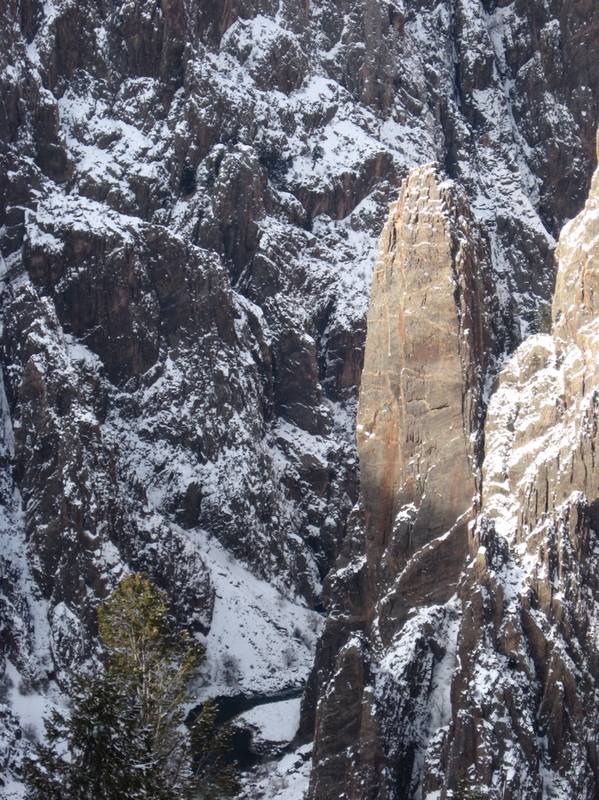 Tremendous icicles hung from the cliffs, and frozen water filled the slot canyon. 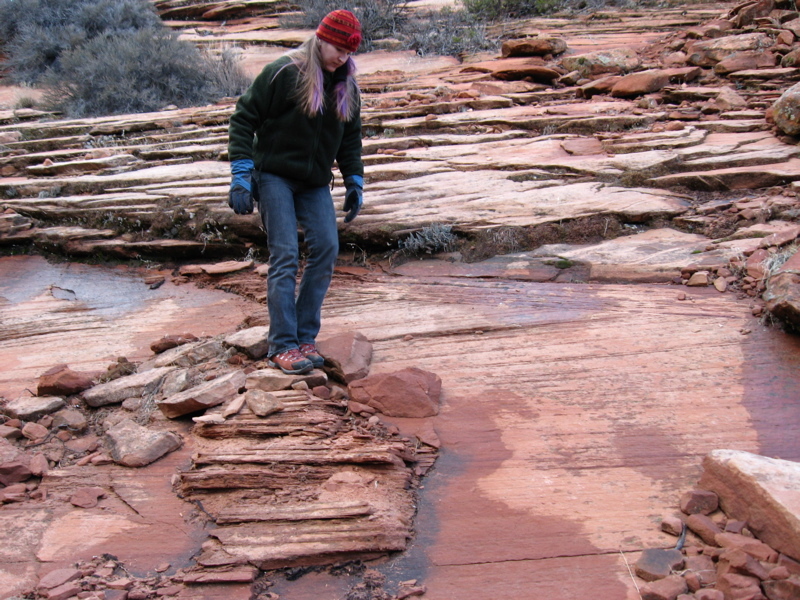 The sandstone was icy and tough to navigate in places, which made progress slow going in places. This is truly grand scenery, red sandstone meeting the white of snow and green of juniper trees. 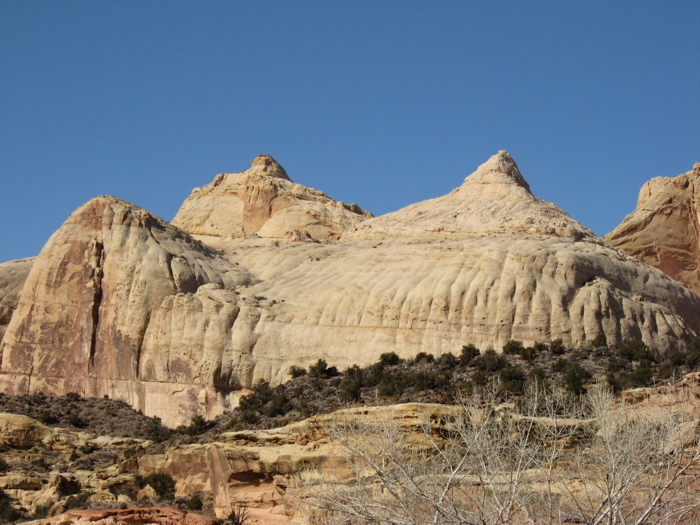 The Navajo Sandstone layer of rock, which runs from pink to white, contains vivid examples of crossbedding, where ancient sand dunes formed and solidified, then were topped by more sand dunes. 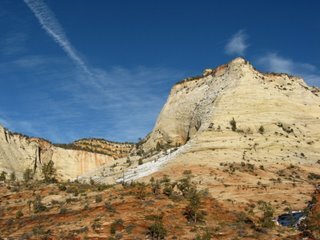 What a magical place this is -- steep, gorgeous canyon walls of sandstone towering above a valley full of cottonwoods and pines. 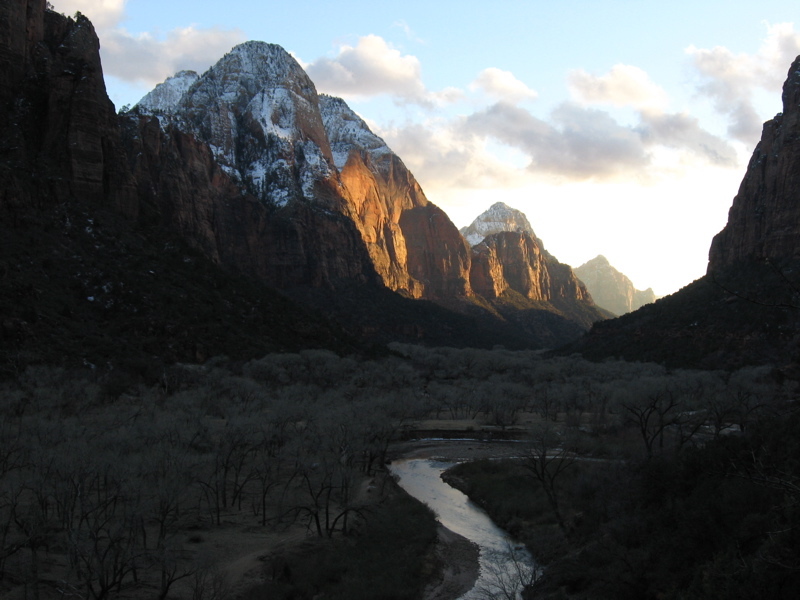 The Virgin River winds through the valley floor, sparkling in the sunlight, roaring over rapids. Snow dusts the higher elevations, glistening white in the deep red and pink of the sandstone. The place itself has a magical feeling, something exquisite and wondrous in those canyon walls. We hiked the Kayenta Trail to Lower, Middle and Upper Emerald Pools. Above us waterfalls cascaded from hundreds of feet up the steep canyon walls. 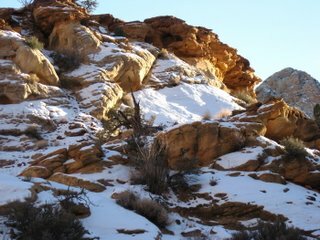 We hiked the snowy trail which wound through deep red sandstone. As we gained altitude, below us the Virgin River became a thin, shining ribbon winding through a forest of cottonwood trees. 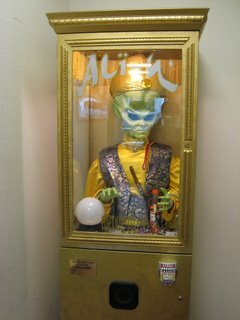 At night, we gazed at brilliant stars. The desert sky was so dark, I could see Comet 17P/Holmes with the naked eye. 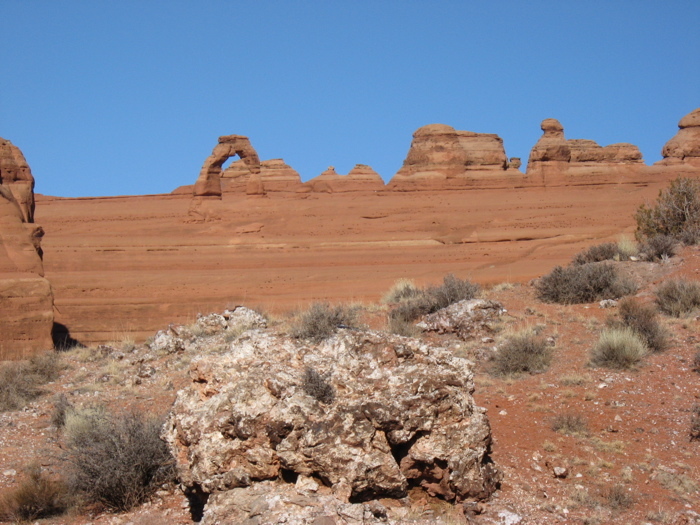 Today we located an Ordivician-age rock outcropping, with some help of the USGS site and my GPS unit. 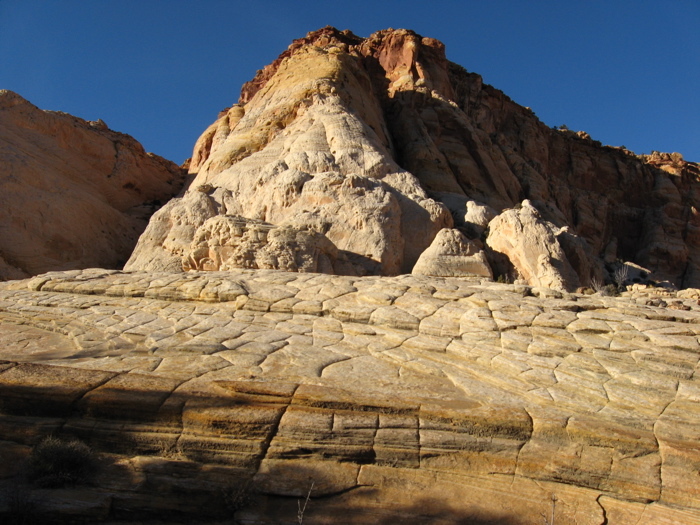 The outcropping is a bioherm, a mound made entirely of marine invertebrate fossils. A long drive down another washboard dirt road led us to the base of the mountain. 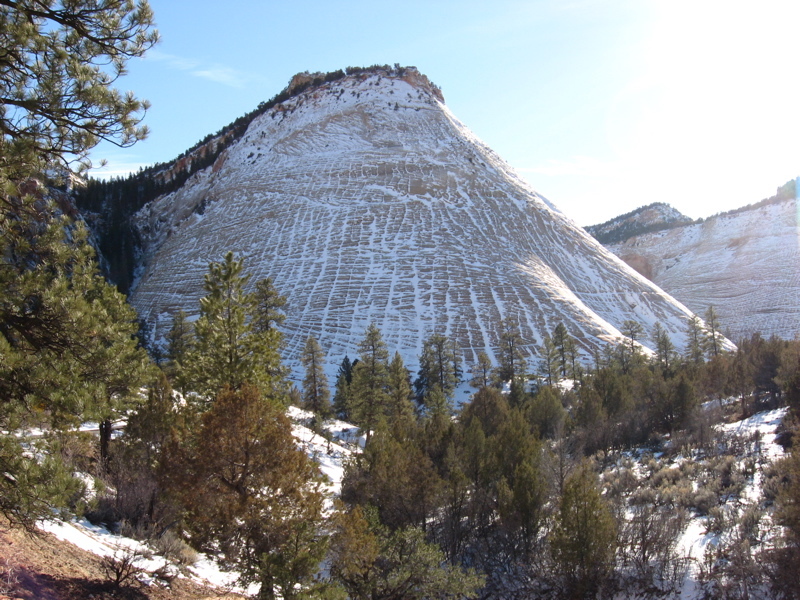 We hiked up the steep slope, toward the band of fossil-bearing limestone dated to around 450 million years. At last we reached it, and saw many cool fossils, including crinoids, bryozoans and some gastropods. 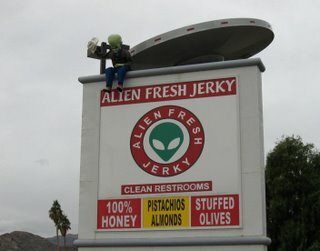 We didn't take any with us, leaving them there for others to enjoy. 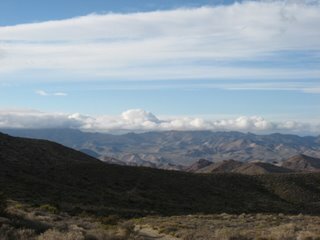 The top of the peak commanded a stunning view of the desert valleys below, with all shades of light and shadows, hills of deep red and green, gray and tan. 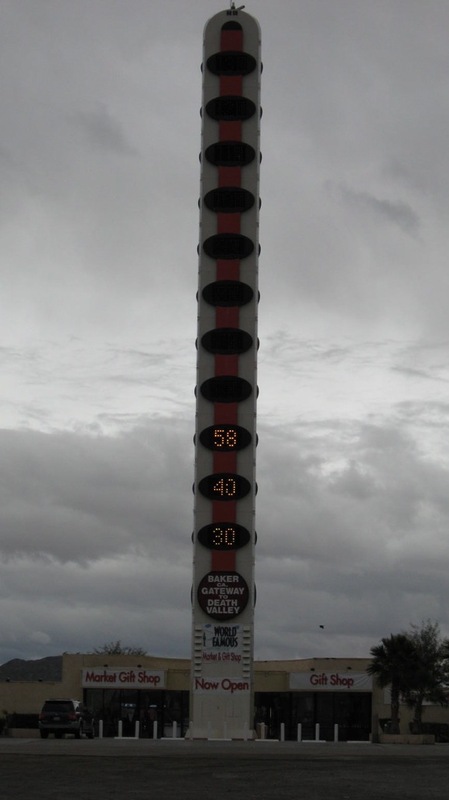 A gorgeous cold, windy and gray day made the climb to the top an exhilarating one. 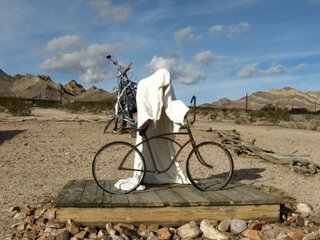 Just outside the ghost town of Rhyolite stands the Goldwell Open Air Museum. 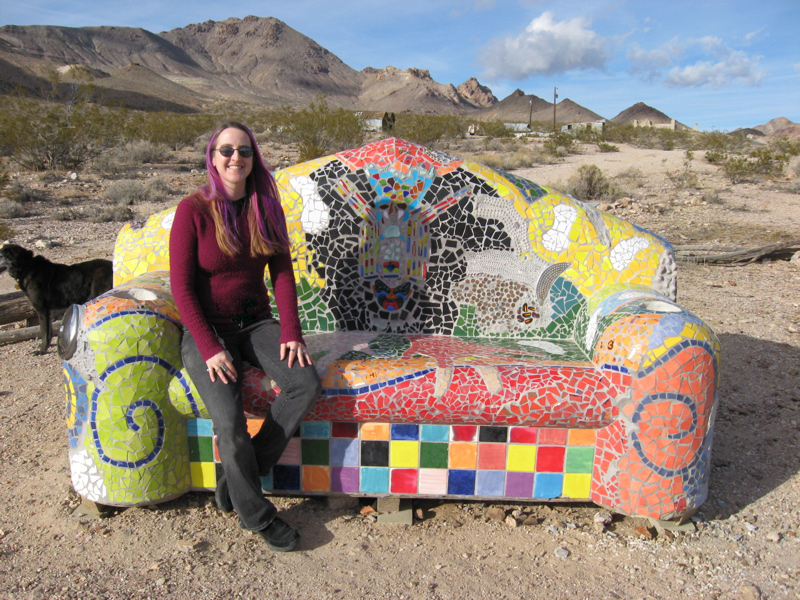 This place is just too cool. A ghost bicycle rider stands beneath a towering miner pointing his pick toward the desert hills. 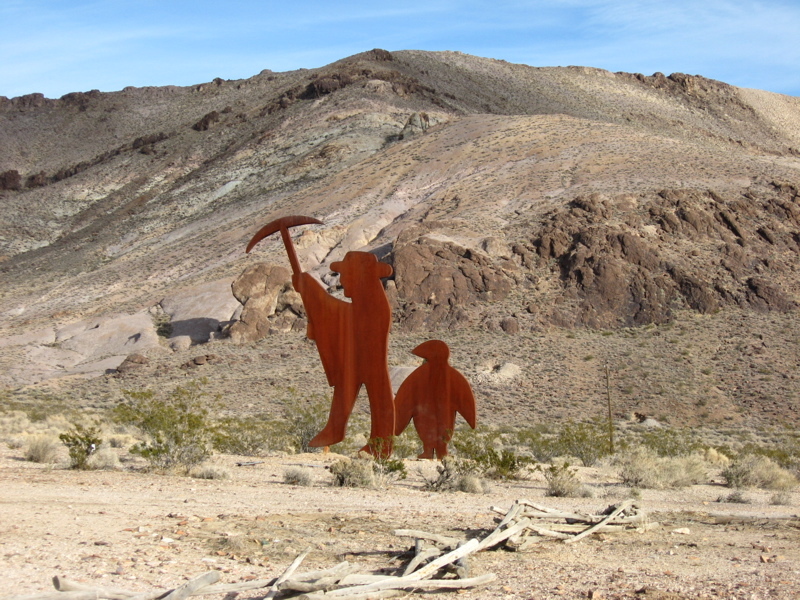 A penguin stands next to the miner. A labyrinth of rocks decorates the ground, and a recreation of the Last Supper, done entirely with ghostly robes, stands on a nearby platform. 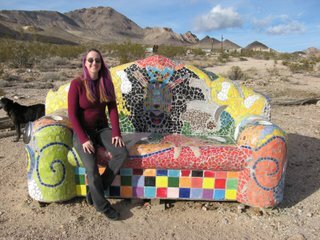 One of the coolest pieces was a stone couch decorated completely by mosaic, including action figures, keys, forks, coins, a Starfleet Communicator, and forming designs of hands, feet, faces, swirls, and leaves. Another sculpture consisted entirely of shiny bu mpers gleaming in the afternoon sun. Today we drove out to the ghost town of Rhyolite, near Beatty, Nevada. 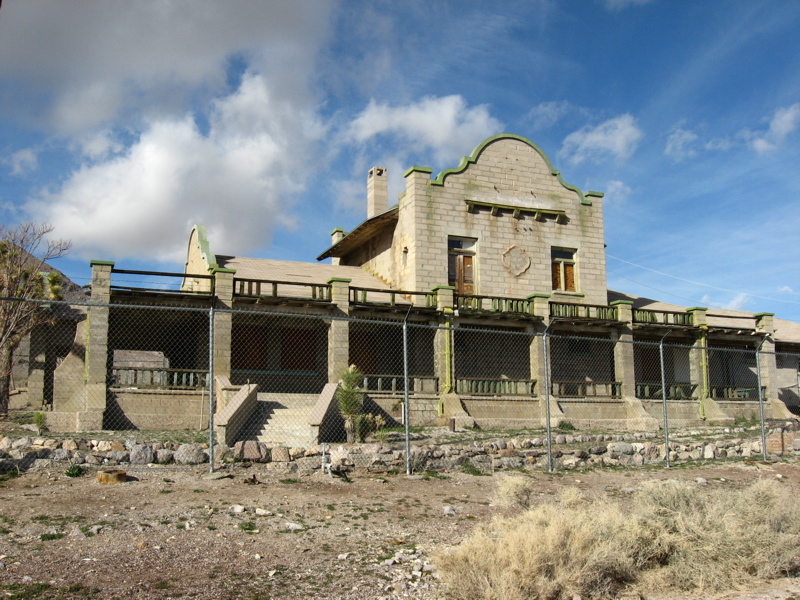 A booming metropolis created in 1904, this town is now little more than a very cool (yet unfortunately falling into disrepair) train depot and a house made entirely of glass bottles. 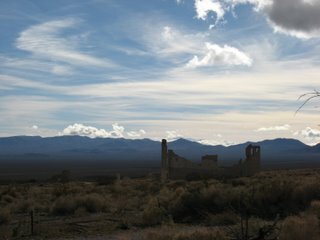 The skeletal remains of other buildings stand stark against the desert sky. 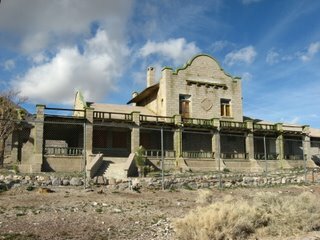 Two walls of a three story office building, the facade of a mercantile store, and the foundations of a school stand crumbling now. 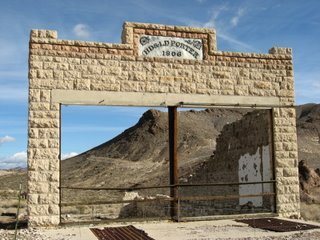 Built around a gold mine that was created in 1904 and closed in 1910 when it was proved unprofitable, the town had a brief time of glory. But when it was in full swing, it boasted telephone lines, electric lights, over forty saloons, an opera house, multiple schools, pharmacies, stores and banks. Today we drove out a dusty 4X4 washboard road to the Racetrack Playa, by way of Teakettle Junction. The road was so rough our top speed was about ten miles an hour the whole way. 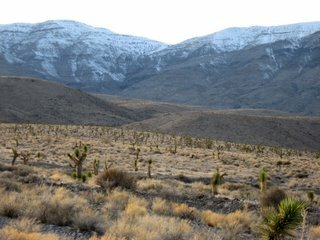 The gorgeous desert floor stretched out before us, meeting with nearby mountains, the tops of which were dusted in snow. 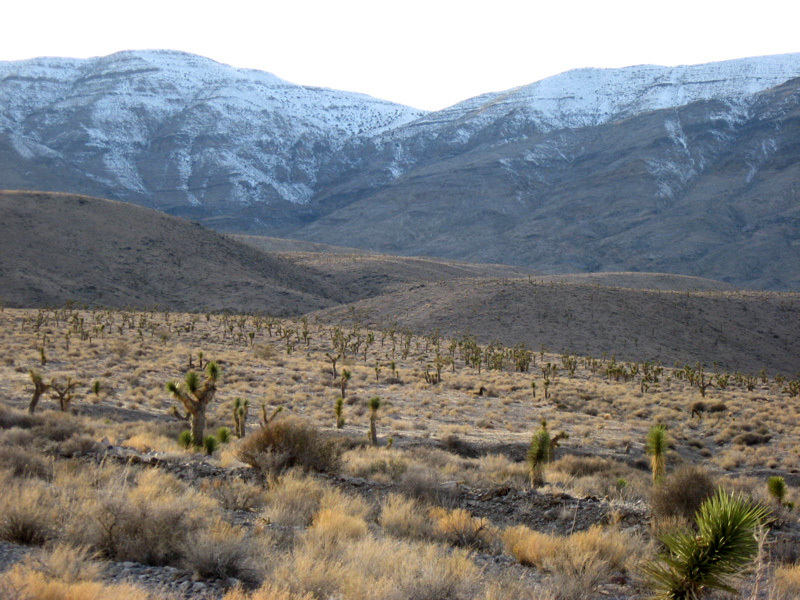 Veritable forests of tall yucca plants towered over golden cholla and creosote bushes. 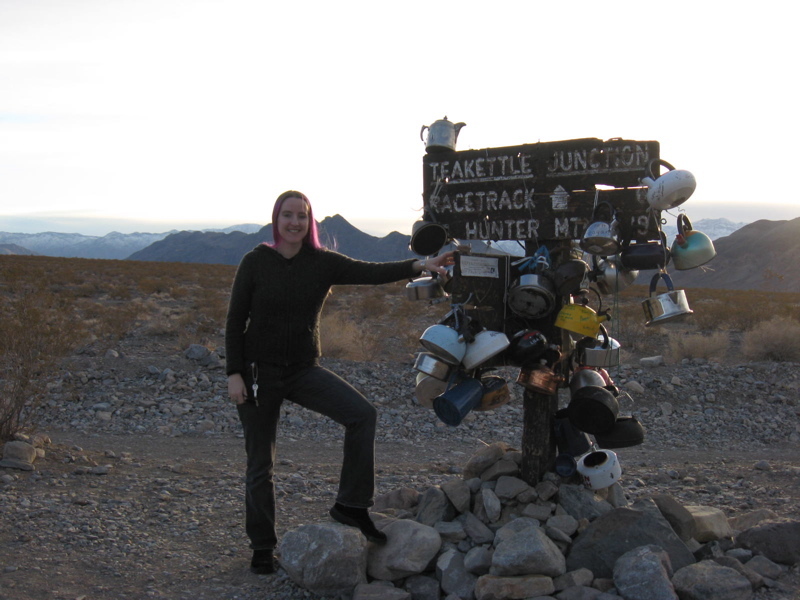 At Teakettle Junction we found the weathered old wooden sign pointing to the Racetrack Playa. 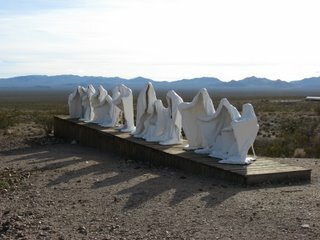 More than twenty kettles draped off the sign, placed by travelers before us, their names inscribed on the kettles. At the Racetrack Playa, we finally saw the mysterious moving rocks we'd read so much about. The playa, which is a dry lake bed and the flattest surface occurring in nature, was cracked and dry today, meaning we could walk on it. 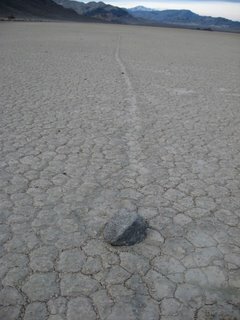 For reasons scientists cannot discern, huge rocks slide around on the playa surface, leaving strange tracks behind them. 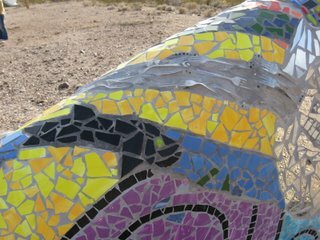 Some go for hundreds of feet, turning 90 degrees, or swerving in circles. But no one knows why or how they do this. We saw a number of these awesome rocks, and stood out on the playa until the sun set, hiking around on the cracked surface and finding more and more mysterious rocks that had moved, leaving long trails behind them. 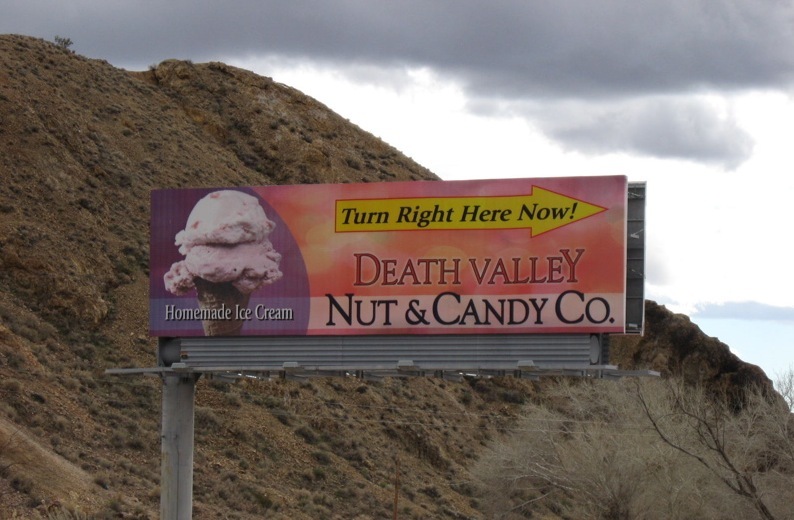 And you thought Death Valley was just about dying of thirst. Death Valley is gorgeous today, stormy and gray, the mountains' colors showy and bright -- chocolate brown, teal, red and gray vivid beneath billowing storm clouds. At the Death Valley Museum, run by the National Park Service, we stood at 190 feet below sea level. 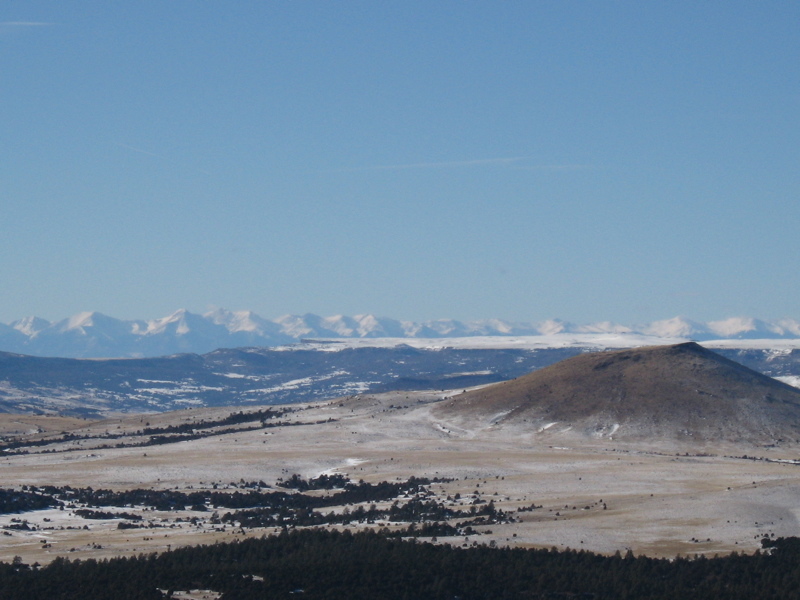 All around us stand rocky mountains with almost no vegetation, with snowy peaks in the distance. 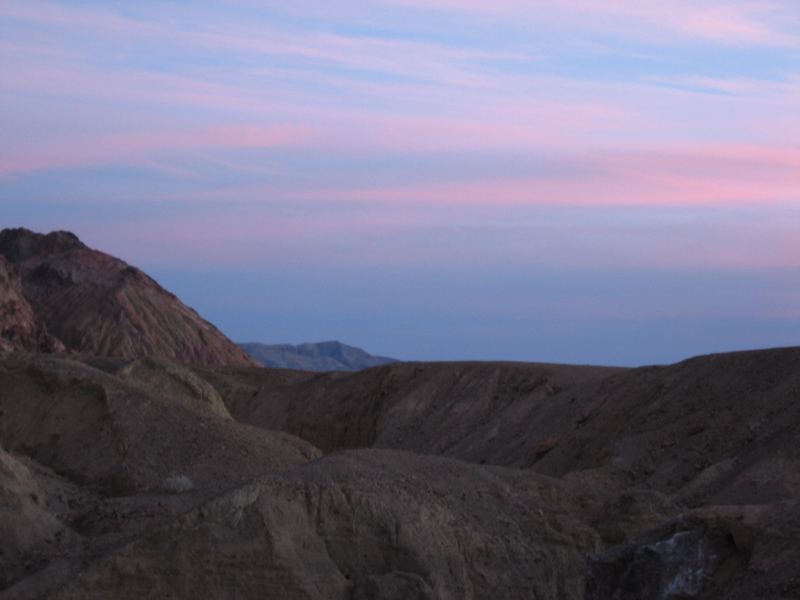 We hiked around at Artist's Palette, weaving between gorgeous hills of deep green, red, brown and gray. Dusk fell over the desert, the sun setting in a bed of brilliant clouds. 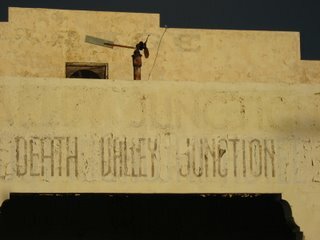 After a long, stormy stretch of desert road, we reached Death Valley Junction. 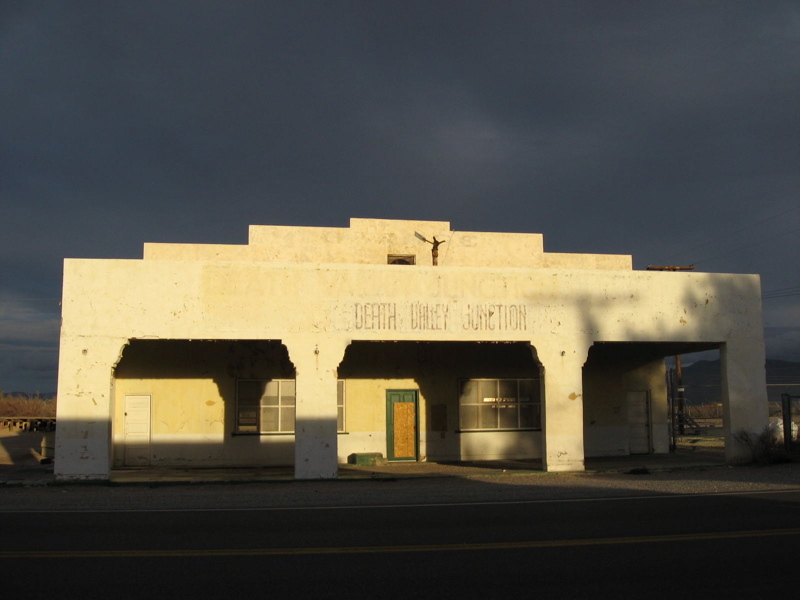 This lonely place, where highways 190 and 127 meet, hosts aged buildings with definite character, most abandoned. 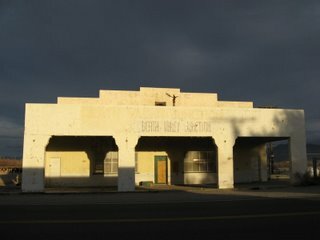 Many of the town's buildings were erected in the 1920s, when the Pacific Coast Borax Company wanted to create a town for its workers. But when mines closed, the population dwindled, leaving behind a ghost town. In this town stands the Armagosa Opera House and Hotel, which is rumored to be haunted by workers from the town's heyday in the 1920s. 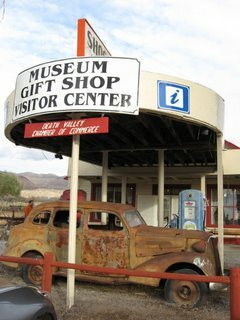 Marta Becket, a dancer and artist, fell in love with the abandoned place when she drove through in the 1960s. 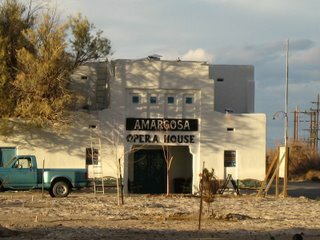 She restored the place, and still performs in the Opera House. 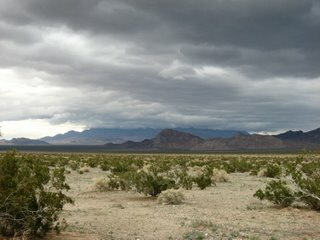 As we left town, we saw wild horses grazing on the open desert floor. 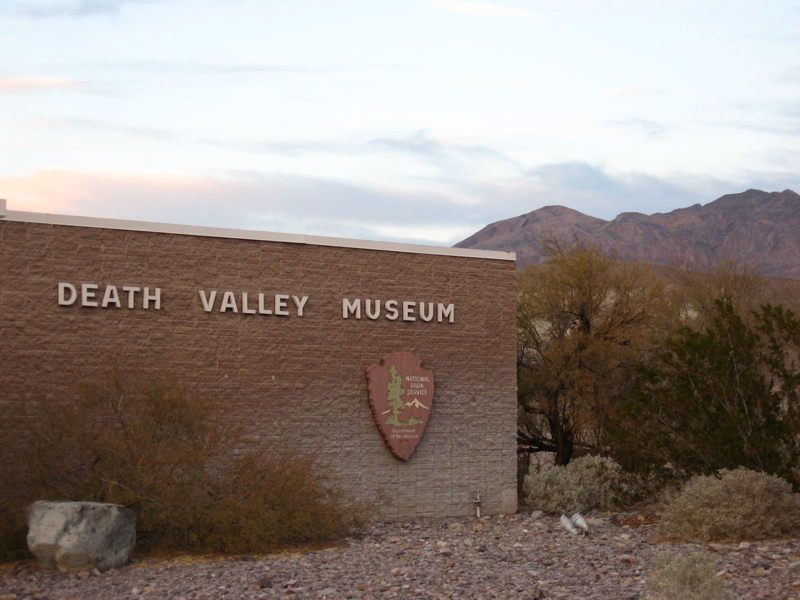 We stopped in the small town of Shoshone, population around 50, to look at the mammoth in the Shoshone Museum, a wonderful one room museum with creaky wooden floors and display cases full of curios and historical photographs. The mammoth skeleton lay in the back inside a glass cage. 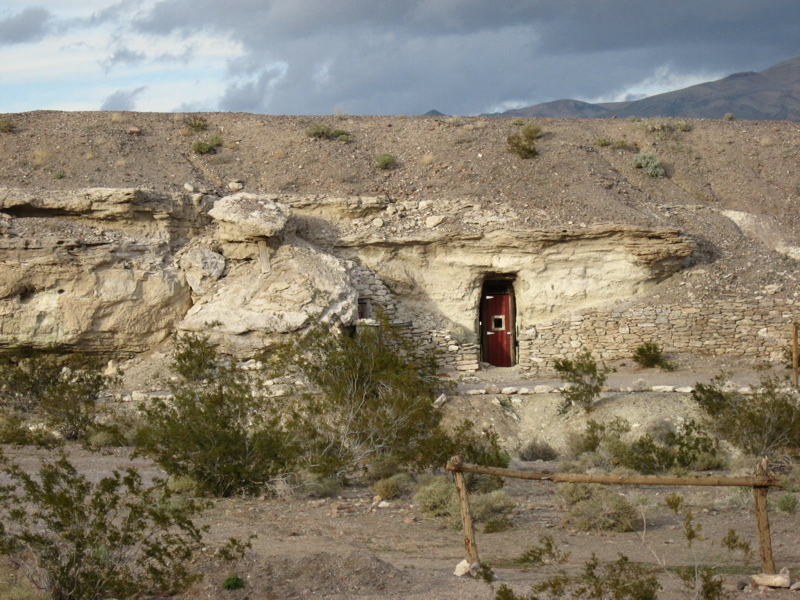 Across the street are a number of caves carved into the rocks by prospectors. 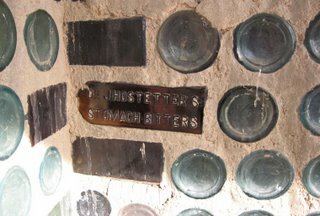 Called the Dublin Caves, they were used as homes as late as the 1970s. 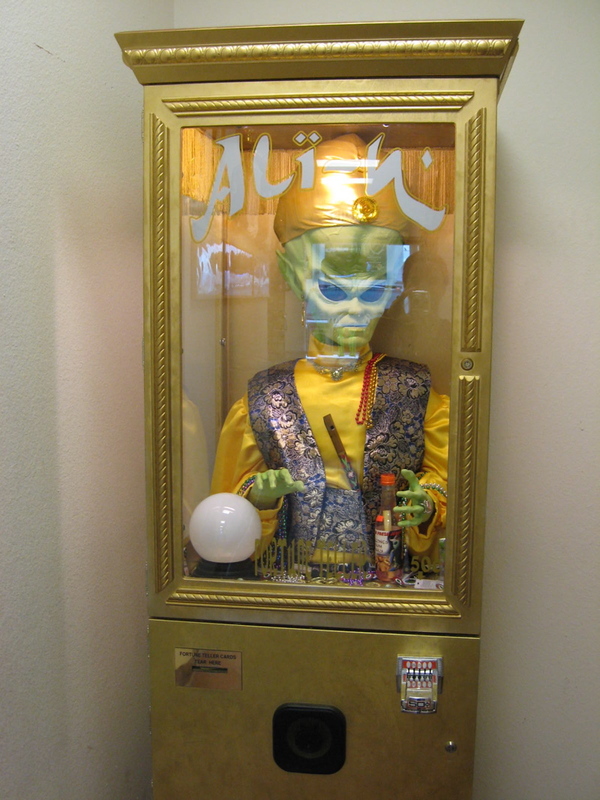 You've waited, and now it's finally here. Your one-stop-shop for fresh alien jerky and fortune telling. 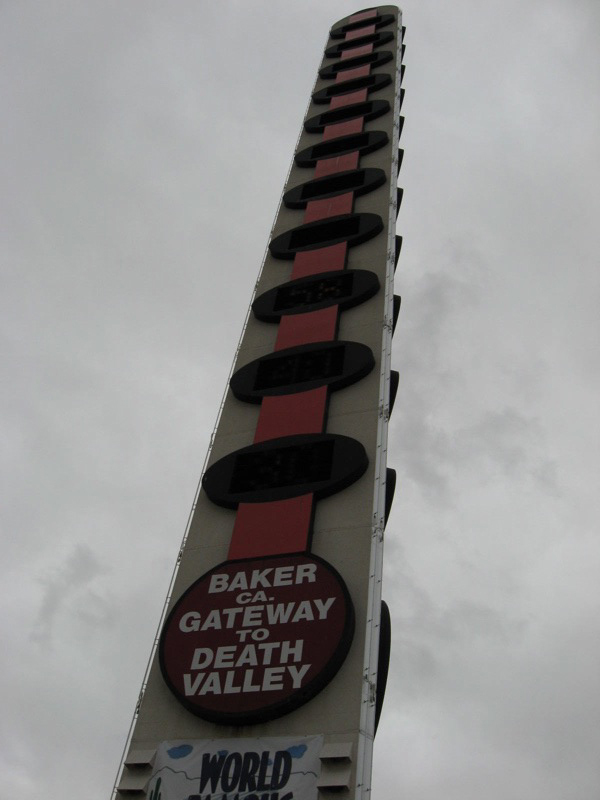 Want to work in a visit to the world's largest thermometer while you're here? Well, it's right across the street. We're in Baker, California -- the gateway to Death Valley and the Mojave National Preserve.